Please join us at this cultural program and spoken-word event at and about the very cool exhibit currently showing at UofL’s Hite Art Gallery in Schneider Hall. It is cohosted by UofL’s Anne Braden Institute for Social Justice Research, the Black Scene Millennium (see www.blackscene.org), and Louisville Showing Up for Racial Justice (L-SURJ). This cultural program focuses on issues of identity in the struggle against racism and in other social justice movements since Stokely Carmichael's 1965 call to "organize your own." There will be conversation, snacks, and spoken-word, including an open-mic part of the program. In 1965, Stokely Carmichael and SNCC made a historic call for Black Power, as well as a directive to all racial justice supporters to organize in their own communities. Groups like the Panthers, the Young Lords, the Young Patriots, and many others responded. Fifty years later, Louisville native Daniel Tucker invited artists and cultural workers to produce new works reflecting on this call to “organize your own” in the struggle against racism. 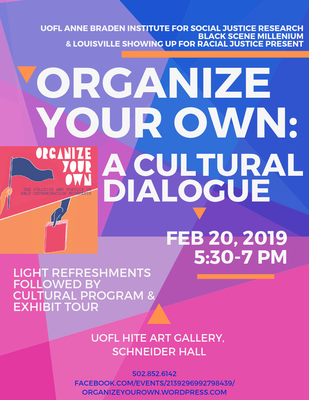 The resulting "Organize Your Own" exhibition has toured the US and is currently on display at the UofL Hite Art Gallery through February 22. This dialogue will engage both the exhibit and the important histories and currents it raises. Curator Daniel Tucker will join us from Philadelphia to tour and discuss the exhibit, and participants will hear more about the exciting revival of The Black Scene, a local 1970s publication. Connect on Facebook Event page.